This time last year I made a vow – after discovering a tiny baby bird alive but flopped on our back deck with a bleeding cut on its back – that if Mrs Pigeon showed any sign of setting up house this year, I would wave her off sans hésitation. I had no wish to repeat that worry or ensuing mercy dash to the vet. I never rang to enquire after the baby’s health but chose instead to believe that she pulled through and grew up to rear a family of her own. But when the day came a few weeks ago that Mrs Pigeon flitted and fluttered around my deck, carrying twigs and fluff and the usual building blocks of a pigeon home, I couldn’t bring myself to stop her. What if she was ready to nest and I upset the process and as a result another chick was lost? The dilemma was momentary and I gritted my teeth, hoping for windless days and no premature barrelling overboard this time. 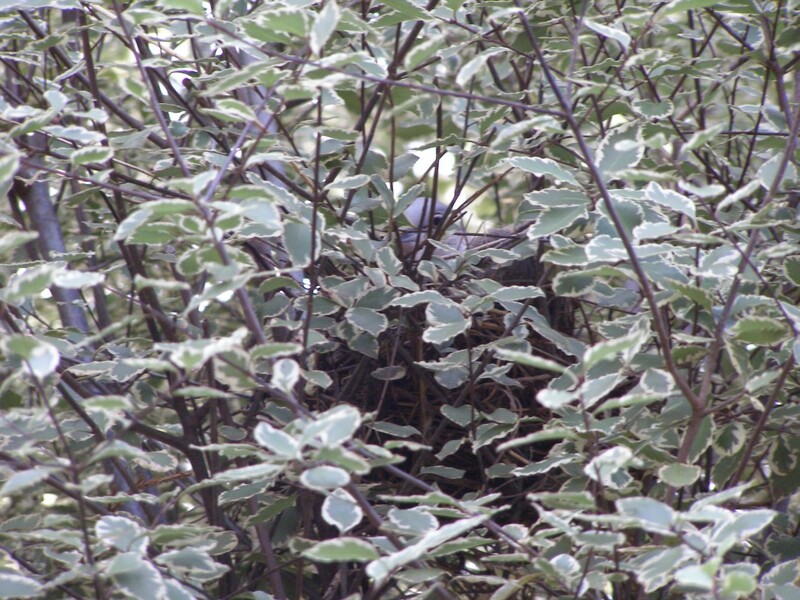 We’ve watched and listened while Mrs Pigeon cooed and sat, sat and cooed until finally, after her comings and goings recommenced, we got to see a little head poking up yesterday and one eye peeping over the top of the nest. A short time later when I went out with my camera, Mama bird had returned and so I asked hubby if he could climb the ladder and take her picture. To my absolute horror, he ventured too close, (we have zoom Mr B, 10x zoom! ), and Mrs Pigeon panicked. She flew out of the nest, under the pergola, crashed into both windows before flying away into the treetops. I’m not sure who got more of a shock, her or us, and I was bereft fearing she may not return and what would happen to baby bird then? Thank goodness, an hour after we slunk inside, out of sight, she returned. This morning, she is cooing and peaceful and I assume that means baby bird is too. Baby birds are as fragile as new stories and Mama birds as flighty as any writer of a new work. Don’t poke the nest or creep too close. Any interference or perceived danger can send the writer fleeing, project abandoned and all the promise of that new work doomed without persistent warmth, heart and gentle coaxing. It may never take wing at all without a long gestation, application, and a writer willing to stick around long enough for it to be ready to throw it out of the nest. Yesterday’s episode is a reminder to me too not share too much of my new WIP at this very early, fragile stage. Sometimes interested others can poke the writer’s nest without intending to and we can be such a flighty bunch. I have great hopes and plans to stick around, but I also have a feeling I’ll be nesting and sitting here a lot longer than Mrs Pigeon. Do you share your WIP? Talk about it? Discuss it with family, friends or the postman? 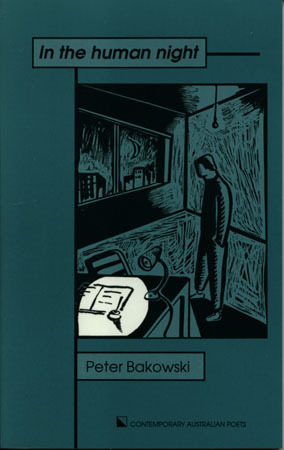 I love Peter Bakowski’s poetry. I can actually understand it and with its varied and recognisable subjects, refrigerators, mountains, clocks and kings, it speaks to me. So many gorgeous lines like “back under the axe of being alone: hearts eaten by banknotes: In your arms I find puddles, xylophones and all my chains turned into skipping rope”. 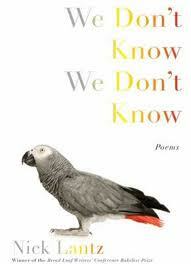 My daughter introduced me to the poetry of Nick Lantz. I found much to love in his lines but my favourite poem has to be Of the Parrat and other birds that can speake, an amazing poem on Alzheimer’s that resonated keenly with me. You can read it by clicking this link http://www.gulfcoastmag.org/index.php?n=2&s=943. Oh Chris. This is a wonderful post and story and I love the analogy with writing. ‘almost’ on speaking terms – but not quite. Hope mother and baby bird cause no more dramas and your husband stops climbing ladders! You are right. Sometimes words are just too fragile to share. Hope all is “happy” again at your end. I think hubbies/partners raise questions and interrogate the story because they think it’s helpful and shows their interest. I now preface many such discussions with, “I’m not looking for any feedback or your opinion, I just want to verbalise what I’m doing.” Unfair, perhaps even mean , but necessary because nothing kills an embryonic story faster than negativity, interrogation, or too close an inspection. Could any of us love even our own flesh in those first alien weeks of forming if we had to look at them too closely? Well, of course we mothers do/did, but I’m pretty sure I thought more of my embryo children as the end product of a baby, just as we can see the possibility of the final, polished story. May your brand new story grow apace. And so happy to read that it had a happy ending despite lack of zoom. I bet Mr Bell will remember what that button does next time. I hope that your words are knitting together magically and look forward to hearing about them when you’re ready. Alison who is always careful not to talk too much about project in the initial stages because then I feel like it’s written and I’m bored by the idea. I look forward to sharing soon with Alison who is very wise not to talk too much in the initial stages. For my last ms I spent an hour brainstorming a plot with my husband who came up with all sorts of useful suggestions! But then once I started writing in earnest, I only shared if I was stuck in a spot. Because he knew the story, he was then able to help me over a few hurdles. But I’m very very careful who I share with. It’s great to have that sounding board in your hubby, Angela. Sometimes I find sharing with Mr B fantastic and other times I can become miffed quite easily – it depends on my emotional connection to the project and the level of my writer vulnerability on the day. I can be a bit precious about coming up with solutions myself, but I do try to reassure him, it’s not him, it’s me. And sometimes I just need his ears not his voice to work out what I’m trying to do. In saying that Mr B is an enthusiastic listener and, dare I say, my biggest fan.